Each year, Bright Lights counts on the community in numerous ways to run a successful summer program. As Classroom Assistant Specialist, I rely heavily on student and adult volunteers to contribute their time as Classroom Assistants. Their commitment helps support the teachers, ensures student success and provides a rewarding experience that makes a difference in the classroom. Last year 192 individuals said “Yes” to devoting 20 hours to Bright Lights as Classroom Assistants. Eighty-two of those volunteers agreed to help with more than one class, accumulating between 40 and 60 hours of community service. I am so thankful for each volunteer I worked with last summer. You kept the classes running smoothly and our students safe and engaged. I know that our teachers can’t thank you enough for your support as well. It’s never too early to start thinking about how you will spend next summer. Do you have a week to give to Bright Lights? Do you know a teenager (completed grade 9 or up), college student or adult who would be a good fit -- someone who is patient, likes being around kids, possibly has an interest in teaching some day or is just a positive influence on everyone? Positions include half-day classes or full-day camps working with teachers and students, assisting administrative staff as office assistants and helping move in/move out of Holmes Elementary, our main program site. Most classes are held at Holmes, while others are offered offsite on the University of Nebraska-Lincoln campus, Lincoln Southwest High School, and the Nebraska Game and Parks Outdoor Education Center. For a more “international” experience, assistants may elect to help at Lux Middle School (June 19-23) when Japanese students take classes alongside American students. 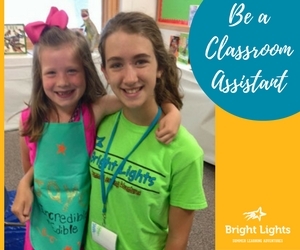 Classroom Assistants can apply online at BrightLights.org starting March 8. Watch for more information as that date approaches. All local high school guidance counselors will have postcards to hand out to interested students in February. In the meantime, I would love to get a list of potential classroom assistants started. Feel free to email me at classassist@brightlights.org regarding your interest.